61 films from all 28 EU nations will screen this month at the Chicago European Union Film Festival. Cannes 2017: "Redoubtable," "120 Beats Per Minute," "Walking Past the Future"
Friday at the Cannes Film Festival included a bomb scare, a Jean-Luc Godard biopic and more. A video preview of this year's Cannes Film Festival! Gaite Jansen on "Supernova"; Memories of Professor Scorsese; Bérénice Bejo on France's year of terror; "Tin Cup" Oral History; Confessions of a Pokémon Go Grinch. Michael Oleszczyk reports on a discovery in the Quinzaine de Realisateurs section at Cannes this year: Diego Lerman's "Refugiado." Cannes, Day Eight: "The Search"
Our Cannes reporter sees critical icebergs ahead for Michel Hazanavicius' "The Search." Barbara Scharres previews the 2014 Cannes Film Festival. Erik Childress looks at the first awards of the season and their possible impact on the Oscar race. Hollywood has the same problem with the Oscars that the Republicans are having with their primaries. They can't seem to agree on a candidate with a broad appeal to the base. All nine Oscar finalists were, like Mitt Romney, good enough to be nominated. But none of them appealed to average multiplex moviegoers, just as it's said Romney doesn't appeal to the GOP base. Indie Spirits are high for "The Artist"
SANTA MONICA, Ca. -- "The Artist," a nearly silent film, made most of the noise here Saturday at the Independent Sprit Awards, wining for best picture, best actor, best director and its cinematography. It was the latest in a series of good omens for the surprise hit, which seems headed for victory at the Academy Awards on Sunday night. It's a sunny, unseasonable 80 degrees as the 2012 Santa Barbara International Film Festival kicks in, but all I want is to be indoors. When you peer at a schedule listing nearly 200 films jammed into 10 days, and you just can't wait, you know you're an addict. This is my third SBIFF so I recognize the signs. Suddenly each January, there's an extra bustle in this appealing, laid-back town. Downtown on lower State Street, trucks appear bearing vivid banners, soon to be festooned overhead. Special lights and rigging go up at 2 central venues - the precisely restored, historic Lobero and Arlington Theatres. Locals watch to see whether Festival Director Roger Durling changes his hair: one year it was spikey, another year purple. This time it's rather like Heathcliff - longer, romantic. 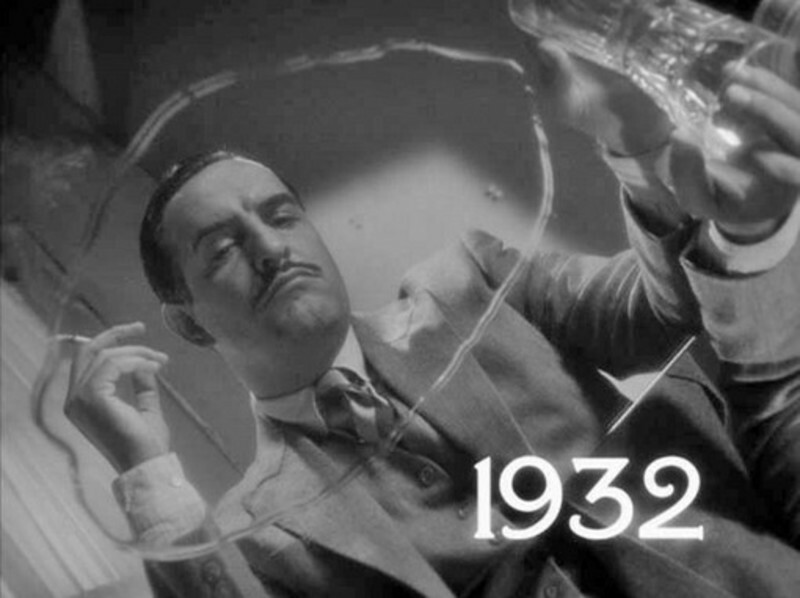 It doesn't take a crystal ball to see that this year's Academy Awards will amount to a shootout between "Hugo," with 11 nominations, and "The Artist," with 10. Fittingly, they are two movies inspired by love of movie history, the first about the inventor of the cinema, the second about the transition from silent films to talkies. The Artist: Everybody loves/hates a frontrunner! I can understand why it appeals so much to Academy voters: It displays great affection for actors and a nostalgic love for the lost grandeur of the movies in general; it addresses anxieties about how new technologies are once again changing the movie business; it's the only Best Picture nominee shot entirely in Los Angeles (something TWC's Oscar campaign is playing up, big-time). Hollywood nostalgia may be warmly embraced Tuesday morning when the 2012 Academy awards nominations are announced. Films involving the invention of the cinema, the transition from Silent to Talkies and the legend of Marilyn Monroe are among those certain to be nominated. Marie writes: Okay, this is just plain cool. This is clearly someone using their brain, in combination with "what the hell, let's just go ahead and try it..."
Dr Julius Neubronner's Miniature Pigeon CameraIn 1903, Dr Julius Neubronner patented a miniature pigeon camera activated by a timing mechanism. The invention brought him international notability after he presented it at international expositions in Dresden, Frankfurt and Paris in 1909-1911. Spectators in Dresden could watch the arrival of the camera-equipped carrier pigeons, whereupon the photos were immediately developed and turned into postcards which could be purchased. (click images to enlarge.) - from The Public Domain Review. Visit the site to see even more photos. Do you expect "The Tree of Life" to be nominated as one of the best films of 2011? When I saw it last spring I certainly did. I assumed it was a done deal. If you'd told me then that "The Artist," a black and white silent film, was stirring up enthusiasm at Cannes, I would have said it sounded like something I really wanted to see. (Picture the headline above in Comic Sans.) MSN Movies contributors have selected our Top 10 Movies of 2011. What does that mean? Whatever you want it to mean. Are these movies "the best"? Are they our favorites? Are they "movies we got to see before the deadline"? In my case, it's some combination of all three -- but I'm really quite happy with the aggregate results. As for my own contribution, as usual I hadn't seen everything I wanted to by the deadline ("A Separation," "Hugo," "The Artist," "Mysteries of Lisbon," "Midnight in Paris" among them), and still haven't, but them's the breaks. My lists will evolve in coming days (Village Voice/LA Weekly poll, indieWIRE Critics Poll, and so on), but I do want to say that I went all-in with my emotions. I picked these movies 'cause I love 'em, not because I merely admire them or appreciate them. The Big List starts here; the individual lists start here. Making lists is not my favorite occupation. They inevitably inspire only reader complaints. Not once have I ever heard from a reader that my list was just fine, and they liked it. Yet an annual Best Ten list is apparently a statutory obligation for movie critics. My best guess is that between six and ten of these movies won't be familiar. Those are the most useful titles for you, instead of an ordering of movies you already know all about. One recent year I committed the outrage of listing 20 movies in alphabetical order. What an uproar! Here are my top 20 films, in order of approximate preference. Over the last ten days or so I have been serially obsessed with "A Dangerous Method," "Tinker Tailor Soldier Spy," "Margaret," "Moneyball," "A Separation" -- and I haven't had time to really devote myself to following these obsessions because I must get to the next movie on my end-of-year "must-see" list, which grows and mutates by the day. Of course, I never do make it to all of them by my deadlines, but between Thanksgiving and mid-December, those of us who whip up those inevitable year-end ten-best lists of movies and who participate in film critics' polls and/or awards balloting feel a little like those wretched souls at Wal-Mart on Black Friday (or is it Black Thursday now? ), busting down doors to get to screenings and screeners so we can see and evaluate everything in the rush before voting day. It's a joy to have these opportunities to see new stuff that might not be released in many cities until late December or sometime in 2012, and to catch up with things that slipped by earlier in the year. But ithe pressure to evaluate everything in "ten best" terms, rather than just watching the movies and thinking about them and writing about them and considering "listworthyness" later on, can also be frustrating. Especially while award-bestowers -- I'm talking about you, New York Film Critics Circle -- have moved their year's-best announcements earlier and earlier (right after Thanksgiving weekend!). So, even as I'm watching things, they're being honored or ignored in various quarters.